Penelope's Place is a 501c3, Non- Profit Animal Rescue and Sanctuary. It was inspired by the rescue of Penelope the chicken. This sanctuary is her legacy. Penelope's Place is currently located in Clarence, NY and serves as a respite to rescued animals. Co-founders Vanessa and Steven Dawson began Penelope's Place in Brooklyn, NY and moved to the Buffalo area to be able to expand the sanctuary beyond the confines of city living. A larger space increases their ability to take in more animals. The grand vision is to not only be a sanctuary for animals but will also be a center for humans to come and receive unique therapeutic healing. We are currently looking to expand even more to better support our mission. Penelope's Place is a vegan sanctuary and operates fully under those values. The animals will never be used for their eggs or meat and we also serve as a place of education about living a compassionate life towards all beings. If you would like to help fund the expansion of Penelope's Place you can donate to the Karuna Campaign, a fund raising effort designed to help with the expansion of the new space, building safe and predator proof structures and a healing center, as well as supplies and veterinary care. Penelope was rescued by Vanessa and Steven Dawson from the religious ritual of Kaporos in 2014. 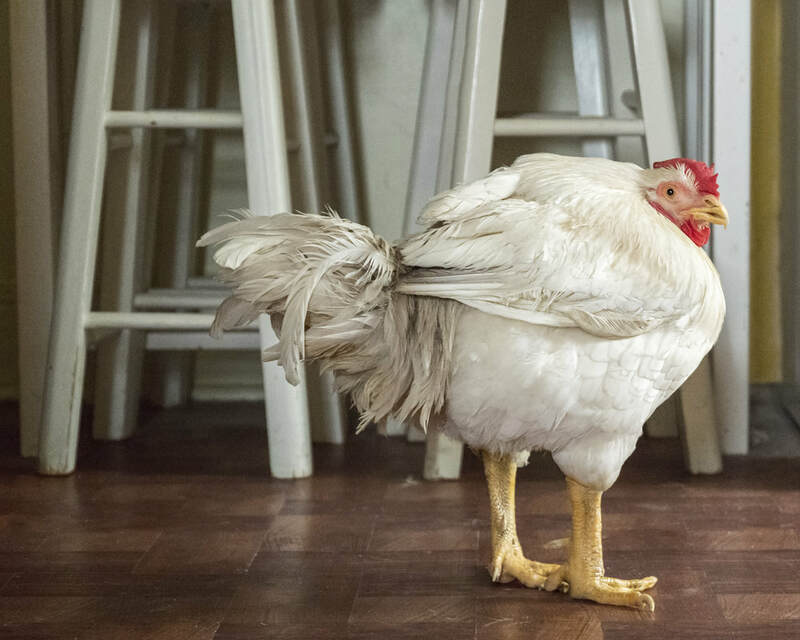 Penelope is the star of the award winning documentary “Penelope: A Rescue Story” and she has become the face of the movement to end the use of chickens as kaporos. Her rescue story has been seen by millions of people worldwide and has inspired many to reconsider the way chickens are viewed by our society. Sadly, Penelope died in May of 2017 due to an un- treatable respiratory illness, but Vanessa and Steven will not let her story end there. They are dedicating their lives to continuing their beloved Penelope’s legacy by starting “Penelope’s Place", a sanctuary where animals like Penelope can find peace. Being so inspired by Penelope's love and experiencing first hand the bond between human and non-human animals, Steven and Vanessa are excited to expand the sanctuary and use their collective talents to help others. Vanessa’s education in yoga, sound, holistic healing and the performing arts, combined with Steven’s experience as a social- worker and psycho-therapist come together to create a unique approach to the healing profession. Their ultimate goal is to help human and non-human animals increase their quality of life. We are an ethical vegan animal sanctuary and rescue. These are the core beliefs that we hold. 2. No consumption and usage of animal products, including from sanctuary residents. 4. We reject the idea of “humane” animal husbandry and ‘welfare’ approaches. There is no right way to do the wrong thing. 7. All human and non-human interactions are respectful – we are not a petting zoo. 8. We will never support purchasing of animals from exploiters/farmers. Liberated or rescues only. 9. Vet care is provided for all residents. 10. Proper nutrition is provided for all residents, seeking to avoid non vegan sources when possible for residents. 11. Safe enclosures for all residents- this includes aerial protection for avian residents. Free range of chickens/ducks equals free lunch for predators. 14. There is no non-vegan food allowed on site. 15. We strive to educate about the victims, survivors and the very foundation of veganism with the general public.